Happy Tuesday everyone! Today and am really excited to be collaborating with LuLu’s again to showcase these beyond adorable red trouser pants. Lately I’m a sucker for all things red. Maybe because I’m having a hard time departing from the holidays, or maybe I’m just overly obsessed with Valentines Day! Either way, these pants are a must have in my opinion. Make sure to visit LuLu’s ASAP! Im not kidding you guys, it is BY FAR one of my favorite websites. I may or not have one or ten things on my wish list from them. 😉 Thank me later. Oh! 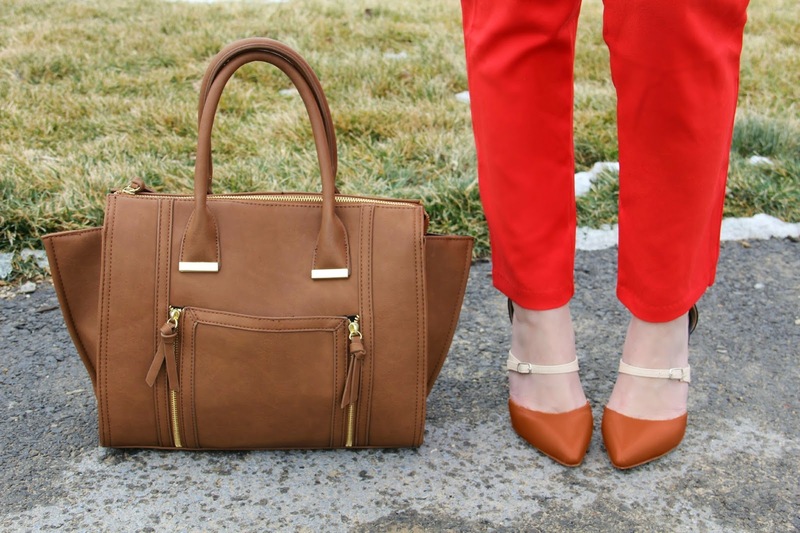 Don’t forget to enter the $550 Nordstrom (or paypal) Giveaway here! Good luck! Super love those pants! I am feeling the same way about red. I have been adding pops of it in every outfit lately. I think you're right, it has something to do with this Holidays >> Valentines Day period. An adorable outfit! The shoes are so unexpected, great twist. You look amazing! I love those red pants with the white blazer! I go to a school where our colors our crimson and cream and this is my favorite combo for basketball games! I love the simple colours in this outfit. And those pants are awesome! Great jacket and accessories too. Love the color of these pants!! That view is incredible!! And being obsessed with red during the holidays is perfectly okay! You wear it so well! Great look and adoring your lipstick. Love the red paired with the neutral colors. Photography is superb as is the outfit, you look stunning! cheap ray ban sunglasses cheap before cheap ray ban sunglasses she answered and said, because it is very strong. Do not think they would give up cheap ray ban sunglassestheir dreams of poverty, poor people discount ray ban sunglasses more to go, and why they are able to persevere, and I always think you're a strong girl, in my mind, you have always been lovely sunshine girl. Although you http://www.odiovisuel.com cheap ray ban sunglasses did not dress up, but you still can not stop austere dress amazing youth. Just ask Hillary Clinton how experience played for her ray ban wayfarers online against then-Sen. Barack Obama in 2008. Come to think of it, it would be worth asking her how she ray ban sunglasses australia thinks it will play in 2016 — and doubtless many people will. And what about Jeb Bush? He has not run for president before, but his brother and father have and ray ban sunglasses online his candidacy is predicated on brand recognition and experience.